Meade Series 4000 Zoom ocular. Illustration courtesy of Optics Planet. Series 4000 Zoom Eyepiece optical layout. Illustration courtesy of Meade Instruments Corp.
Meade has a long history of knocking-off products originated by others. (The Celestron C-8 and the Questar 3.5, for example, provided the inspiration for Meade's best selling SC-8 and ETX-90 telescopes, respectively.) Could the Series 4000 Zoom be another example of Meade's propensity to copy rather than originate? Possibly, for the competing zoom oculars from Celestron (8-24mm) and Orion (7.2-21.5mm) have different optics, eye reliefs and apparent fields of view (AFOV) at the various focal lengths. Only the Meade zoom is so similar to the Tele Vue zoom and only Meade claims design by an unspecified "world leading" optical designer. What Meade doesn't claim, unlike Tele Vue, is 100% quality control. This was obvious, as the first Meade zoom ocular we received had an eyelash or something similar trapped inside its optics and centered in the field of view. It was clearly visible to anyone who bothered to look through the eyepiece, so obviously no one at Meade or their supplier had. That required returning the eyepiece for replacement. This is a perfect illustration of why it is worth the extra cost to buy top quality optics. There are unseen differences, such as quality control, that separate the premium from the merely average. The Series 4000 Zoom Eyepiece came out of the box with the usual plastic cap over the bottom barrel, to keep out dust and crud, but no cap for the other end of the ocular to keep it clean and fingerprint free. I understand that Meade is building to a price point and in this case has to under-cut Tele Vue, but come on! The Lanthanum glass field lens provides increased eye relief, making this zoom ocular suitable for use by eyeglass wearers. In that regard, the soft rubber eyecup can be folded down for use with glasses. I found the eye relief of the Meade zoom to be generous, although it decreases somewhat in the middle focal lengths, apparently reaching its maximum 16mm at the extremes (8mm and 24mm). 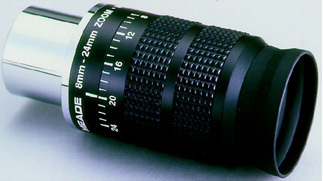 Focal lengths are marked around the bottom of the eyepiece with hash marks in 1mm increments and numerals indicating 8, 12, 16, 20 and 24 millimeter focal lengths. Unfortunately, the numbers are upside down when the ocular is used in a star diagonal. Note that the apparent field of view increases as the focal length decreases. This is typical of zoom oculars and results in a narrower apparent field of view at low powers and a wider apparent field at high powers than you would expect from similar fixed focal length oculars. Compared to a typical Plossl ocular (50 degree AFOV), the Meade zoom has a five degree AFOV advantage at 8mm and a 10 degree disadvantage at 24mm. I spent a little time looking at the Andromeda Galaxy and considerable time observing Jupiter through a fine Celestron Omni XLT 102ED telescope using the Meade zoom at all of its available focal lengths and comparing it to several fixed focal length oculars. The latter included a 7mm Burgess/TMB, 9mm Burgess/TMB, 14mm Tele Vue Radian, 18mm Celestron X-Cel and 25mm Celestron X-Cel. All of these are premium oculars. In each case, I set the Meade zoom as close as possible to the focal length of the fixed power ocular. Looking at the Andromeda Galaxy, the zoom's restricted AFOV (40 degrees) at 24mm (the best available focal length for the purpose) was very apparent compared to the 55 degree AFOV of the Celestron 25mm X-Cel eyepiece. The X-Cel is far superior for observing large deep sky objects like the Andromeda Galaxy. On the other hand the zoom, set to its 24mm focal length, did provide an adequate field of view to find Andromeda in the first place. Viewing Jupiter, contrast and brightness seemed a little lower than the fixed focal length oculars and internal lens flare in the zoom was a little more apparent, as you would expect from its more complex optical design. The Meade zoom introduced a tiny amount of lateral color error (color fringing) that was not apparent in the fixed power oculars. Also, and somewhat surprisingly, I found it necessary to re-focus the Meade zoom as I changed focal lengths, even when I initially focused at the highest magnification setting (8mm). Overall, however, the differences between the zoom and the fixed eyepieces were not dramatic when viewing Jupiter. Since the zoom's focal length range is intended for medium to high magnification viewing and its AFOV is maximized at the short focal length end of its range, observing the moon and planets is its forte'. Optically, this Meade Series 4000 zoom is a good performer and I think that most purchasers will be well satisfied. Certainly, a zoom eyepiece is more convenient in the field than constantly changing oculars to get just the right magnification and field of view. It is also useful for determining the best focal length to use for viewing a particular object under the existing seeing conditions. You can then switch to a similar fixed focal length ocular for definitive observation if you want to. My guess is that most of the time you will not find it necessary. I also had an opportunity to compare the Series 4000 to a Tele Vue 8-24mm Click-Stop Zoom, the eyepiece the Meade so closely resembles in specification. At all focal lengths, I found the Tele Vue very slightly superior, probably due more to careful assembly and 100% quality control than to any inherent difference in the optics of the two zooms. The Tele Vue is also easier to use; the stops at the 8, 12, 16 and 24 millimeter settings are much more convenient and positive than the markings on the Meade's barrel, which are difficult to see at night. Of course, the Meade Series 4000 Zoom is about half the price of a Tele Vue Click-Stop Zoom. My conclusion is that the Meade Series 4000 8-24mm is a high performance zoom ocular, at least if you get a good one. Unfortunately, Meade has a poor reputation for customer service and their quality control is sketchy, increasing the likelihood of needing their questionable customer service assistance. If you want careful assembly, assured quality control and good customer service, buy a Tele Vue or other premium zoom ocular. However, if money is tight and you feel lucky, the Meade zoom's optical performance is very good.